Bots are something that Facebook and other messenger services are pushing very hard. A lot of the messengers have already allowed users to have the option to choose a quick option once you start the conversation with a bot but until recently Facebook only allowed chat. 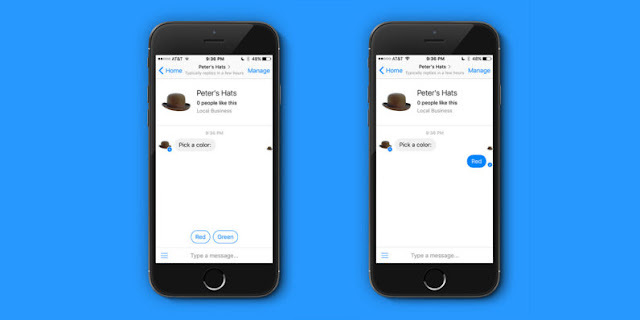 Now Facebook has finally introduced quick choose buttons and now the bots can send more than just text. The biggest improvement to this are the buttons. Before, there were stories of people getting very frustrated because they didn't know what to type to get the result they wanted. A menu means they can easily pick what they want to do and they can go through whatever the process is as quickly as possible, which is why bots are generally considered a good idea. Even if a lot of people don't use them. Facebook introduced these bots to make things smoother, but this is the first time that they've actually done anything to make the process easier. This isn't going to make the bots less annoying, but it should mean that you don't have to talk to them as long as you might have had to in the past. You can also now mute conversations with bots if you can't get them to stop messaging you. The whole process is still awkward and you might choose to mute the conversation so you don't get bothered at work or wherever. If you find the bots too much of a problem, then you can send feedback to the developers, which they can access privately in a dashboard to see what works and what doesn't. As well as all this, bots can now send you GIFs, audio, video and other file types. This could make business on there easier as it means they can send you receipts, help and other things like that so much easier. You do have to wonder why they'd need to send GIFs, but Facebook has said before that they want talking to a bot to be like talking to another human. It's questionable whether these new updates will encourage more users to actually talk to bots but the streamlined process is better for everybody.